Torborg, 47, has brought her successful R3 weight loss program to the Archdiocese of St. Paul and Minneapolis, meeting with more than 30 seminarians at the St. Paul Seminary School of Divinity in St. Paul and a dozen area priests on Saturdays to set goals focused on losing fat, overcoming sugar addictions and developing lifelong healthy habits. Her program, which helps nearly 19,000 clients through social media in the United States, Canada and as far as Australia, is based on her 25 years of experience in personal training and weight loss techniques. Early in her career, Torborg dreamed of using her exercise science degree from Arizona State University to become the next Jane Fonda or Denise Austin, but she found her niche in large health clubs and corporate fitness programs. Later living in Fairfield, Pennsylvania, just 2 miles from Mount St. Mary’s Seminary in Emmitsburg, Maryland, she planned to combine her passion for wellness and her Catholic faith by implementing her program at the seminary. When her husband was offered a job in his home state of Minnesota, they relocated to Shakopee in August 2017 with their five children and joined the parish of Sts. Joachim and Anne. 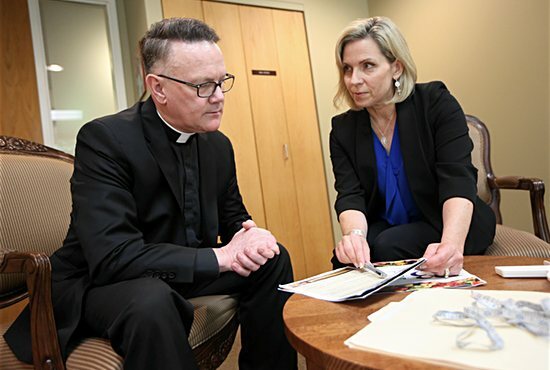 Weeks later, Torborg connected with Bishop Andrew Cozzens at a fundraiser, and she emerged as “a natural fit” for one of the needs identified in the 2016-2017 clergy support initiative and through the St. Paul Seminary’s Institute for Ongoing Clergy Formation — to help priests, deacons and seminarians nurture their physical health. “Because we are composite body and soul, in order to serve as the Lord wants us to serve, we have to seek to be healthy, so we can be who Jesus wants us to be and carry out our mission,” Bishop Cozzens said. After meeting with Bishop Cozzens and later touring the St. Paul Seminary, Torborg planned a Saturday workshop in February and met individually with seminarians and clergy to share details about her program, R3. Through R3 (R3weightlossplan.com), participants set attainable goals and journey through three two-week stages — reset, reintroduce and real life — aimed at switching from fat storage to fat burning, learning portion control and choosing foods for increased energy. There’s no counting calories, weighing foods or purchasing expensive meal replacements. Instead, the program teaches healthy habits that can be applied to real life, including in religious ministry where heavy comfort foods and treats are often available in the parish office or rectory. Susan Torborg provided helpful diet and exercise tips that can apply to seminarians and clergy in her R3 program or anyone working to live a healthier lifestyle. The tips have been edited for length and clarity. Trust the process. Follow the plan and reread it often for familiarity. Stay accountable by finding an accountability partner online or in person to ask questions, give advice, get tips and share recipes. Weigh and take your measurements on day one and only once every two weeks. Eat according to hunger. No counting calories, weighing food or journaling. Don’t skip snacks. Set a timer to remember to eat every two to three hours, and make sure to have the right foods available. Drink water. Carry a refillable water bottle and say, “Jesus, I trust in you!” every time you take a sip. Start moving. Pray the rosary daily while you walk or jog, and schedule weekly exercise times where you pray the Hail Mary for every push-up. Have tools available to navigate through rough patches. Torborg can recommend strategies according to your specific needs. Plan your next “real life” or splurge meal. Forgive yourself and live in gratitude. Know that you might fall off track, but you’ll be ready to jump back on. Torborg walks with the seminarians and clergy through the process, meeting initially every few weeks and then monthly to check their progress and provide encouragement. She attends Mass with the participants regularly and prays for them daily as part of her vocation as a Carmelite. Father Rolf Tollefson, 47, is the pastor of St. Hubert in Chanhassen and has worked with Torborg to lose the extra pounds he’s gained in middle age. Through Torborg’s program, he’s learned to drink more water, reduce his carbohydrate intake and each more foods with protein. He now opts for yogurt, meat or eggs for breakfast and has become “best friends” with broccoli and kale. In the first month, he lost more than 12 pounds of fat and more than 11 inches. Doughnuts after Sunday Mass now give him a headache because of the sugar, signaling a recalibration to prefer healthier food choices — an internal change that spills into the spiritual life. Father Tollefson has always been active with biking and cross-country skiing, and now he’s added sit-ups, push-ups and planks to his workout routine. He also prays the rosary when he runs on the treadmill. He’s still searching for practical workarounds for eating healthy in the midst of a busy schedule, but he feels encouraged by the simple tenants of the program. “Our bodies are a temple of the Holy Spirit, so we don’t want to haul a bunch of junk into the temple of the Holy Spirit with Cheetos, Doritos and all of those good things,” he said. Deacon Andrew Zipp, 25, has trimmed nearly 5 percent of his body fat and gained more than 3 pounds of lean muscle since starting the program in February. Through the support of Torborg and his classmates at the St. Paul Seminary, he feels motivated to make better nutrition choices while maintaining a realistic lifestyle that still fits within the R3 program. He was recently ordained a transitional deacon, with hopes of being ordained to the priesthood next May, and will serve at Holy Family in St. Louis Park this summer. He knows that the influx of energy and better sleep will help him in his ministry. “Knowing how to eat healthy is going to help me maintain this energy and to have energy to serve the people of God,” Deacon Zipp said. Torborg feels an overwhelming sense of joy seeing her participants succeed, noting how priests, deacons and seminarians often thrive because of their high level of discipline and structure. She hopes to use her format as a template for other seminaries, dioceses and parishes to ensure that spiritual leaders can live out their vocation to the fullest. Torborg can be contacted at susantorborg@R3weightlossplan.com.